I was extremely hesitant to see Kung Fu Panda 2 because I absolutely loved the first one. I know that seems odd, but I just didn’t think there was any point in trying to top perfection. Kung Fu Panda has such an airtight story, mirroring the growth of Po with his mentor Shifu, that there didn’t seem to be any room left for further development of these two characters. Anything that came next would likely just detract from what came before. Boy was I wrong. I owe the makers of Kung Fu Panda 2 an apology for doubting their creative abilities. This sequel is even better than the original in many ways, and I am excited to tell you about my discovery of this gem of a film. When I first heard about Kung Fu Panda 2 I thought it would be one of two things: a complete rehash of the first film with a different villain, or an atrocious origin story where Po visits the panda village where he grew up. It wasn’t until I saw a glowing review from the Nostalgia Critic a few weeks ago that I decided to finally give this film a chance. I am so glad I did. It turned out to be, ironically, a brilliant melding of the two things I had been worried about. Kung Fu Panda 2 is one of the rare sequels, such as Aliens, The Godfather Part II, and Toy Story 2, that deepens the first film rather than cheapening it. It takes everything that worked in the first film and improves upon it while creating its own unique identity as a standalone film. From the opening backstory I knew I was in for a treat. It feels more epic than what had come before while still being accessible. Everything that follows just keeps getting better and better. Lord Shen has a lot of similarities to Tai Lung, though he is an even stronger villain. Both feel spurned by their parents and are banished from their homes for many years before they finally make their dramatic returns. 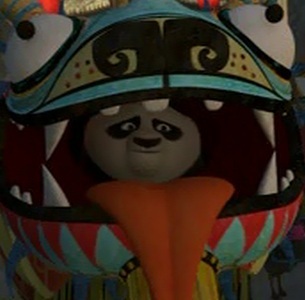 Po accidentally becomes the Dragon Warrior while Tai Lung failed to deserve that honor because of his ambitious nature. 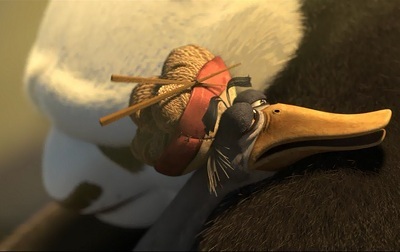 This severely angers Tai Lung, but he’s not angry at Po, but at his former mentor Shifu for feeding his ambitions and being at least partly responsible for his fate. Shen, on the other hand, specifically hates Po because it was prophesied that a panda would defeat him. He wiped out Po’s entire village in an attempt to thwart the prophecy, and he thought that he had scarred Po for life. But Po turns out to be much stronger than anyone could have guessed. Tai Lung attacks mostly defenseless bunnies, pigs, and geese in the Valley of Peace, and he is acting out of a childish need for revenge. Shen has deadly cannons and an entire army to back him up as he attacks some of the best Kung Fu warriors in all of China. His goal is nothing less than the destruction of Kung Fu and his ascension to supreme ruler of the world. He ups the stakes both emotionally and physically, providing a seemingly undefeatable foe for Po. After Shifu found peace at the end of the first film, I was worried that there was nothing left to do with his character. Tai Lung’s story was so intertwined with Shifu’s that I thought that there was no way to shoehorn him into another story where he wouldn’t warrant such a big role. Evidently, the makers of Kung Fu Panda 2 agreed with me. They have Shifu show up briefly at the start to set up the situation and then at the end to offer a few words of wisdom. 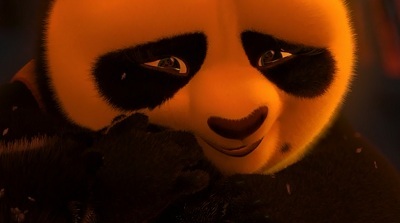 I like Shifu, but his presence would have been distracting from Po’s evolution and his relationships with Tigress and the rest of the Furious Five. In the first film, Po’s dad Mr. Ping is a bit of a nuisance. Just about every scene he is in he is primarily talking about noodles, and he never seems concerned about his son’s feelings. But in Kung Fu Panda 2, he does an about-face and every time he is on screen he is talking about his son and worrying about his safety. I finally understand how much he loves Po. Through flashbacks, we see how many sacrifices he made to rear Po as his son and how dedicated he is to Po’s happiness. When he cries out in joy and hugs Po at the end, I get a real sense of the depth of the emotional attachment between these two. Suddenly, Mr. Ping is no longer a pain. I have a nearly 2-year-old daughter who really likes certain movies, and I’m hesitant to show her anything that has even a hint of content that would upset her. For example, she burst into tears while I was watching Apollo 13 during the scene when the three astronauts raise their voices in frustration at each other. She’s a sensitive soul. Kung Fu Panda 2 is a rare film that she absolutely loves, even though it contains a scene that makes her cry every time. It makes me cry, too, no matter how many times I watch it. Po has repressed the memory of his mother abandoning him because it is so painful, but in the best scene in the whole film, he finds inner peace by letting his memories flow and finally seeing that his mother was protecting him by hiding him from Shen and the murderous wolves. Watching the last few moments Po’s mother had with him and seeing the sudden transition in animation from 2D to 3D is so effective and beautiful it is difficult to describe. It’s amazing the range of emotions that she conveys with her facial expressions without ever speaking a word. She’s trying so hard to comfort her baby to keep him from crying and to express the lifetime of love she wishes she could share with him, it’s impossible not to be overwhelmed by it all. 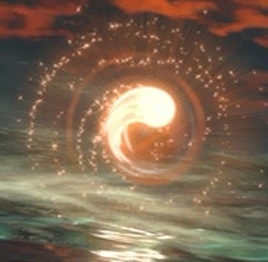 Do you see how this enriches the first film? Tai Lung was abandoned as a cub, too, and Shifu raised him as his own son. But while Shifu filled Tai Lung with prideful aspirations of becoming the Dragon Warrior, Mr. Ping simply did his best to keep Po happy and well fed, and it was Po who naturally yearned for greatness. His father neither unduly encouraged nor prevented his son from becoming a Kung Fu warrior. He simply loved his son. Everything is tied together beautifully by this origin story. Po’s relationships with Mr. Ping, Lord Shen, Shifu, and Tai Lung are all immensely expanded, and both films take on a melancholy and majestic new tone. Kung Fu Panda 2 is one of the best movies I have ever seen. It is a perfect story with amazing performances and so much clean comedy. I didn’t even touch on all of the hilarious jokes and gags this movie has to offer. All of them are as good if not better than the ones in the first film, especially the dragon costume scene. Check this film out as soon as possible. You will be amazed how much a movie called Kung Fu Panda 2 can make you laugh and cry. This is the Deja Reviewer bidding you farewell until we meet again. Read more Pleasant Surprises here. All images are the copyright of DreamWorks Animation. This entry was posted in Pleasant Surprises and tagged animated films, comedy, dreamworks, films, kung fu panda, movie review, movies, sequels. Bookmark the permalink. This movie was great. It made the first one feel a little empty in comparison though. I need to go back and watch the original to see. I think that the story of the second one is much stronger because it focuses so much on Po and the Furious Five, but the first one does an excellent job of fleshing out Shifu and introducing Po and the Five. The first was just meant to be fun, and it definitely succeeded. The second one takes everything to a new level, just like Spider-Man 2 and The Empire Strikes Back did. If the first one isn’t as great in comparison, at least it’s nice to know it’s building up to something even better. Good review. I have never seen this movie and didn’t care much for Kung Fu Panda. As I was reading this I remembered why I didn’t like the first film. I felt like at the end that Po was no more a Kung Fu master than he was at the beginning. His defeating the villain was just pure luck rather than any talent or illustration of strength.